TK Rising wants to bring a new perspective to life on Earth and beyond in the Blue Star series. TK is a resident of South Florida. Daniel had two parts to him; there was the boy everyone saw, and then another part of him, a part he shoved away and disassociated himself from for so long. That part of him was a murderer, and the thing that came tearing into his closet one night resonated with that part of him. Its name was Phearus, it had been damaged, its memories were unclear, and it was hunting the worst of man to feed to the thing, hunting it through the tear. Just as Daniel resonated with it, it in turn became part of him, and in time Daniel sought to feed that lost part of him, drawing him closer to Phearus who had long been absent from the cupboard in the pink house. Just as Phearus was starting to think of Daniel as his son, he was torn from 1981 into the future of another dimension, and he will do whatever it takes to get back to him before history says he disappeared. Fictional historical meets futuristic sci-fi all rolled into the timeline of a single being is precisely what you'll get if you pick up TK Rising's Pink House. Gods, turf wars, human meddling, primitive natures, and of course, the hunt. The book follows two main plot lines, the first of Daniel, a boy turned serial killer, and the second of Phearus Elconn, son of Godriel Elconn and heir to the greatest house on Alta. There are some tense situations and times where you really don't know who to root for. This character-driven plot will push you to the edge of your seat with some of the atmospheric and gripping scenes you'll encounter. Horror, time travel, gods, and mortals all wrapped in a tightly woven story filled with its own unique complexities. It is the third book of the Blue Star series but information about the multi-verses, territory control and events are explained at the front to allow the reader to simply pick up the book and enjoy. Pink House (Blue Star Book 3) by TK Rising is young adult fantasy novel with a touch of science fiction that also explores time travel. We first meet Daniel as a young boy living with his mum. After leaving her abusive partner, Daniel’s mum manages to pull the family together (Daniel and her). Everything seems to be going smoothly, despite the financial struggles, until Daniel’s father shows up demanding to have the boy back. Daniel is in great turmoil as he recollects the previous events which still plague his mind. The weird flashing lights, the horrific sounds, and the later arrival of the alien through his closet introduce him to a whole new world. With time he learns the alien’s name and his ways. A bond between them develops that will continue for years. There are many interesting twists in Pink House by TK Rising. So much goes on with each passing moment that it is easy to remain transfixed while reading. What started as an ordinary narrative took a whole different turn as I kept turning the pages. TK Rising also touches on the pain of abuse through the character of Daniel’s mother, who suffers emotional, sexual and physical abuse at different stages of her life. The plot is exhilarating and when time travel and planet invasion are introduced in later parts of the book, they take the reader on an extra roller coaster ride. There are great aspects of Pink House, but perhaps the best is its ability to captivate. Daniel seems like a sweet, innocent little boy, but the truth is that he will do anything to protect his mother and her memory. But as he continues to grow up, he becomes something even more dangerous and, with the past he’s overcome, it may be no surprise why he becomes what he is. But what about Phearus? The strange creature that comes from a completely new dimension? When Phearus is sucked into a new time and dimension, however, it may take a great deal more to get him back to where he wants to be. With the Vanguard arriving and a mix of different dimensions and timelines being forced together, there’s no telling what could happen next in Pink House by TK Rising. If you’re looking for action, then you’re definitely in the right place because this book is all about action. There are plenty of characters going through an array of different situations, but even more than that, there are dimensions that cross, flex and intertwine in a completely different way. Will Rivera and the rest be able to send Phearus and the Vanguard back to their own dimensions? Will the alien creatures take over everything? There’s no telling what could happen next in this book, and there’s no way of knowing if they’ll make it back to where they want to be. Even more, you never know what all of the other characters are going to do, including Tristan, Jewel, Makka, and so much more. Pink House is a book that will make you think and keep you guessing along the way. Pink House (Blue Star Book 3) by TK Rising is a unique blend of fantasy, science fiction and the bond of relationships. Daniel seems like a normal boy, raised by a hard-working single mother after his violent father disappears. But Daniel has a dark side too, and he tries desperately to hide this part of his personality. Suddenly, Daniel's world is turned upside down when the nightmares begin which transport him to strange lands. As Daniel tries to understand what is happening, he realizes there is a weird entity hiding in the shadows of his closet in the Pink House. Phearus, the alien being, has travelled back in time to enlist the help of Daniel. Phearus understands the murderous side of Daniel’s personality; he starts to think of Daniel as a son. Suddenly Phearus is transported back to the future where he faces destruction. He must find a way back to 1981 and Daniel before it is too late. Pink House (Blue Star Book 3) by TK Rising is such a unique and enthralling story. The author has woven together science fiction, fantasy, time travel, enduring and destructive relationships all in one outstanding story line. The plot never stands still; it is fast, exciting and tense in places with a dark unnerving thread of abuse and neglect running through it too. There is an eclectic mix of characters but all are distinctive through their behaviour and dialogue. The scenes are very descriptive so you feel transported into the pages of the story. There are some great villains in this story too. I would have loved for them to have a larger role in the plot because I feel the author would have done an incredible job building them into more substantial characters. The ending was absolutely perfect. An incredible book and highly recommended. Pink House is another work of fantasy and science fiction written for young adults by author TK Rising. In this third addition to the Blue Star series, we meet a new character in Rising’s ethereal world where fantasy and sci-fi collide with personal, emotive narratives. Daniel is a young man who comes from a somewhat violent and difficult background, and though everything appears normal on the surface, the boy hides a terrible, murderous secret. This leads him to bond with the dark and dangerous Phearus Elconn, an alien being who utilizes time travel to bond with the boy and the two sides of his personality. Having read the second book in the Blue Star series some time ago, it was fascinating to see how Daniel’s origin story comes about and how it connects to the wider world and time line of the overall plot. Author TK Rising introduces and employs the time travel concept well here, without interfering with any of the previous plot lines of the series, past or future. We have a chance to see a new darkness develop in a villainous yet sensitive character, and watching Daniel slide down that dark and slippery slope was powerfully emotive. Once again, Rising mixes the fantastical action-packed plot with a highly emotive narrative, combining a lot of information into a novella-length package that adds to the overall canon of the series well. Pink House is a must-read for established fans of the series, and for readers who enjoy seeing the progression of a hero into a villain. As the third book in the Blue Star Series, Pink House by TK Rising continues the journey of Jewel, Tristan, Blue Star, and the others. Plus, it introduces a new character, Daniel, who has an interesting effect on Phearus. As Daniel grows up, his abusive and unstable life brings forth his darker side. Often alone, because his mother has to work to support them, he discovers Phearus hidden in the shadows of his closet. The two form a bond brought about by a deep understanding and a dark desire to hunt. Just as Phearus begins to envision a future with Daniel as his son, he is ripped from Daniel’s timeline and thrown into the future where his existence is uncertain. Can he save himself and get back to Daniel before it’s too late? The game of power TK Rising plays out in Pink House, which began in the first book of the Blue Star series, is a constant back and forth between the Creators as their creations make their moves. One of the things I love about this book is the fascinating structure of the setting and how it weaves through the lives of the characters, transcending time and dimension. Pink House is an assorted mix of science fiction, fantasy, and time travel. Underneath all of this, it is a story about relationships and how the actions of one ripple out to affect so many. 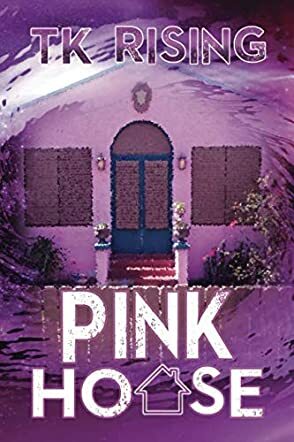 The distinct characters of Pink House move through a fast-paced plot, struggling to survive the constant fluctuations of things beyond their control. Overall, I enjoyed the turn of events in Pink House as it brings about closure to this part of Blue Star’s journey and those affected by her existence. Pink House (Blue Star Book 3) by TK Rising is the third book in the series about the multiverse, alternate versions of Earth and the people who control them. I have not read the first two books, so the quick recap, in the beginning, was helpful to me. The story starts with Daniel and I thought it was interesting that the writer was able to show how the actions of individuals can have such a huge impact on the world around them. Daniel is a boy in 1977 and he has his first encounter with Phearus, whom he will meet later in life when he hires him to kill for him. Daniel seems normal enough, considering the recap lets us know about his future 'career choice', but then we learn more about him and his violent father. It added some layers to the story, which it needed. TK Rising has created an interesting and ambitious book with Pink House (Blue Star Book 3). I love the idea of the multiverse and how our choices and the paths we choose shape the world around us. The idea of different Earths with different outcomes has always been fascinating. I think that the characters in the book were well developed and that the story moved at a good pace. I think it would do well on the market, particularly in the science fiction market. I would definitely recommend it to fans of science fiction and stories with a different vision of the world.